Tuesday 17th November – New English BJJ (Brazilian Jiu Jitsu) Champions were crowned last weekend at the English Open BJJ Championships held at Dartford Judo Centre on the 14th and 15th of November. Over 600 athletes and spectators gathered over two days to take part in one of the most prestigious events in the UK. 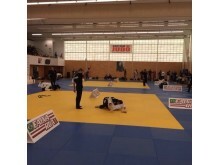 The national competition is held annually under the auspices of the UK Brazilian Jiu Jitsu Association (UKBJJA), the sport’s governing body elect, and amongst the most important events of the year for UK BJJ players. 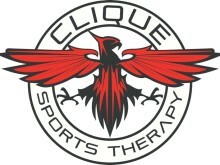 Men and women travelled from across the UK for their shot at success in their respective categories. The field included first time white belt competitors, former champions bidding to defend their titles, and experienced black belts who have competed at the highest level in the UK and beyond, fighting for gold, silver and bronze medals and the chance to be crowned English Champion. The English Open is the final ranked event of the year for adult athletes, and alongside the British Open it is one of only two events at which points for podium spots are weighted with a x4 multiplier. 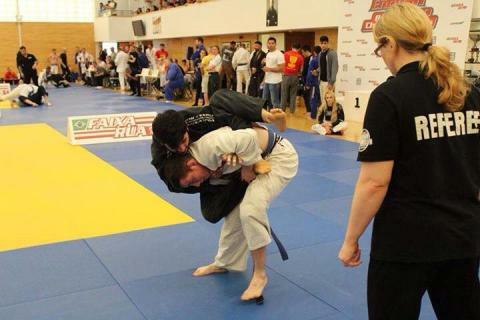 Providing a ranking system which recognises the top BJJ players and supports the best run UK competitions is integral to the UKBJJA’s strategy for elite athlete development and the growth of the sport as whole. 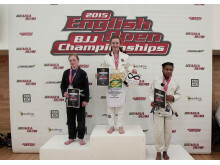 A sense of anticipation filled the venue as the first fighters stepped on the mats at 10am on Saturday morning, marking the beginning of two days of intense competition at which not only English titles were on the line but also top spots in the UKBJJA’s rankings for the best athletes of 2015. 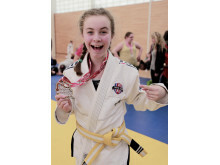 With sponsorship from the UKBJJA on offer for the highest ranked athletes at each belt, the premier status of the competition meant there was a lot at stake. For several fighters success at the competition guaranteed their top-ranked status with outstanding performances. 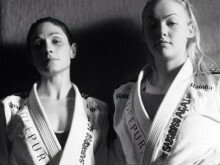 Kyra Robinson and Jane Kotchkina, who both train in London, won double gold in their weight class and in the open weight category and shot to the top of their divisions, whilst Ashley Amos, who trains with UKBJJA Head Referee Dave Coles in Hereford, achieved the same feat in his divisions. In a close race for first spot in the blue adult male rankings between the Hereford fighter and Tom Spibey who trains in Nottingham, Ashley’s results secured him the top place in the male adult blue rankings for 2015. Ashley’s success at blue replicates his achievement last year when he finished the year as the top-ranked white belt. Late in the afternoon on Sunday in front of an eager crowd of spectators, the last fight of the weekend proved a fitting finale to two days of outstanding BJJ. Two of the most promising prospects on the UK BJJ scene, River Dillon and Sean Coates faced each other in the open weight class final of the male adult purple belt division after winning gold in their own weight classes. Sean, who trains in Nottingham with black belt Victor Estima, had already secured the top spot in the purple belt rankings, whilst River, who trains in London, became English Champion in his division for the third year in a row. The showdown between the two was a close fight which ran the full 7 minutes. River came close to a submission move to win the fight but Sean’s defence proved hard to break down; at the end of the fight River’s aggressive attacks secured him a win on points. Amidst the competitive rivalry and battles for top-ranked status, there was always time for good sportsmanship, respect and fair play, as coaches and competitors came together to appreciate the achievements of each individual who became English champions. Competition organiser and UKBJJA Chairman Richard Martin commented: “It was an amazing weekend at the English Open BJJ Championships. Thank you so much to everyone who helped to make it such a fantastic event, especially the competitors who came and showed the best of UK Jiu Jitsu once again.” As UK BJJ athletes prepare for national and international competitions in 2016, the prospects look bright for the future of the sport in the UK. 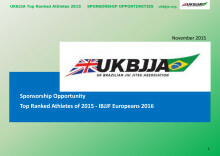 The UKBJJA (www.ukbjja.org) is a not-for profit organisation which aims to provide a governance structure for the martial art of Brazilian Jiu-Jitsu, that promotes and develops the sport while allowing individual clubs and practitioners the space and freedom to practice the martial art in the way they enjoy. The UKBJJA is currently under assessment to be recognised by Sport England as the governing body for Brazilian Jiu-Jitsu in the UK. 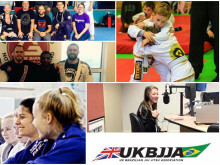 The UKBJJA was formed in 2013, and the association’s goal is to foster the development of BJJ at elite, community and grassroots levels, raising the profile of the sport but also providing pathways for development and involvement across communities in the UK. 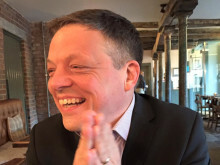 Visit UKBJJA at www.ukbjja.org or follow us on Twitter @ukbjja.